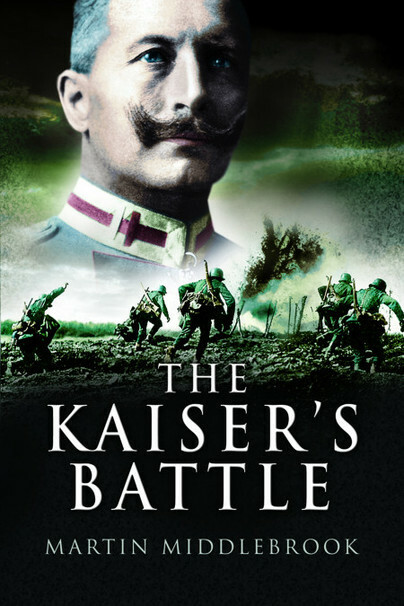 You'll be £16.99 closer to your next £10.00 credit when you purchase The Kaiser's Battle. What's this? At 9.30am on 21 March 1918, the last great battle of the First World War commenced when three German armies struck a massive blow against the weak divisions of the British Third and Fifth Armies. It was the first day of what the Germans called the Kaiserschlacht (‘the Kaiser’s Battle’), the series of attacks that were intended to break the deadlock on the Western Front, knock the British Army out of the war, and finally bring victory to Germany. In the event the cost of the gamble was so heavy that once the assault faltered, it remained for the Allies to push the exhausted German armies back and the War was at last over. Martin Middlebrook's The Kaiser's Battle remains the definitive account of one of the most important days of the fighting on the Western Front in the Great War. Martin Middlebrook needs no introduction. Author of 16 books, including The First Day on the Somme, he is well known for his detailed research and clarity of style. His books include The Peenemunde Raid; Your Country Needs You, (both Pen and Sword Books), Task Force: The Falklands War and The Fight for the Malvinas. Martin's late wife Mary Middlebrook played an active part cooperating with her husband’s literary activities, particularly with photography and artwork. At 9.30am on 21st March 1918, the last great battle of the First World War commenced when three German armies struck a massive blow against the weak divisions of the British Third and Fifth Armies. It was the first day of what the Germans called the Kaiserschlacht ('the Kaiser's Battle'), the series of attacks that were intended to break the deadlock on the Western Front, knock the British Army out of the war, and finally bring victory to Germany. In the event the actual cost of the gamble was so heavy that once the assault faltered, it remained for the Allies to push the exhausted German armies back and the War was at last over.